I waited at the bar longer than I normally would just to see how long it would take for the gormless Australian barmaid to serve me.She had nothing else to but but still took 4 minutes before asking if I wanted anything (why else would I go into a pub if I didn't?). Told her I had given up a long time ago, just wanted to see how long it would take her to realise someone wanted to be served, and walked out. Beer OK. Bloody noisy with the doors open though! Unexceptional is a great word to describe this pub. Nice Australian staff and a half reasonable pint of London Gold, but not as good as either the Kings Head or the Courtfield. Food looked cheap and cheerful, but i didn't partake. Dead as a doornail on the 23rd December??? 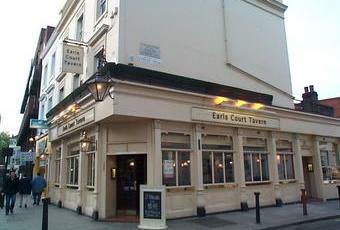 Where does everybody go in Earls Court at Christmas? This is a very unexceptional pub and I left without a drink as I didn�t appreciate standing at the bar for two minutes whilst waiting for the barmaid to finish on the phone. I spotted Doom Bar, Youngs Bitter and Pride during my wait and there was also another ale being conditioned. On my way out I noticed the plasma screen which was showing Sky Sports News which was muted and also a sign on the door advertising for team players (waiting staff), maybe they should also be looking for more bar staff. I cannot see myself returning as there are better pubs opposite the tube station.